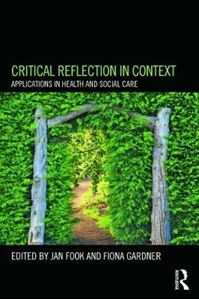 Critical reflection enables practitioners - especially those within health and social care -to theorise from their own practice, improving and developing their work and practising both creatively and professionally. This book provides an accessible overview of the influential Fook/Gardner Critical Reflection framework for students, researchers and professionals. It then presents a wide range of illustrative case studies from a variety of different health and social care settings, demonstrating how it can be used in effective and innovative practice around the world. By highlighting how professionals are actually using the Fook/Gardner model of critical reflection, it shares practical and resourceful ideas and provides specific theoretical and practical guidelines for use. It also further conceptualises and develops the theory of critical reflection by articulating underlying theory used in practice. The book also draws out particular issues for how critical reflection might be better practised within organisations, and develops a framework for a better understanding of this. The book is divided into four parts, discussing critical reflection in: * Professional Practice * Supervision and Management * Research * Education Including an up-to-date overview of the framework written by Jan Fook, this helpful text makes a significant contribution in terms of the practical theorizing of critical reflection. It will be of use to health and social care professionals keen to practice creatively and effectively, especially those undertaking short courses or further development in supervision, critical reflection, advanced practice, and leadership and management.